Hearts are ever popular among those doing a country theme in their home, and the Amish recognize that. You will notice a number of our Amish products have hearts in them or on them, and this lazy susan condiment tray is no exception. 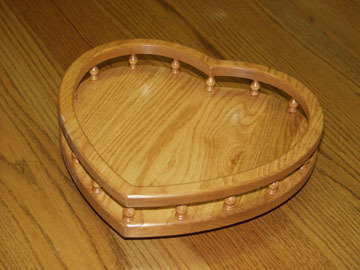 Made of solid oak in the shape of a heart, and including a heart-shaped rail to go along with it, this one will fit right in with your “homey” country theme. Notice the attention to detail the Amish have put into this item - the grain of the rail lines up perfectly with the grain of the bottom. This one also swivels around so for easy access to whatever is on it. Shown in light oak here, but we can stain it to whatever you need.